Another hiatus, and another long dearth of posting. For those who might care, it happened that my later summer/fall got slammed with waaaaay too much work. After my boss retired I took his duties for a month or so, then went full bore into teaching for 6+ hours a day, every day for most of October and half of November. I'm still digging out from the pile, but am managing to leave (mostly) on time. It's been a treat. That said, prior to the madness, there was a Warmachine/Hordes Journeyman League held at Everything Games this past summer to coincide with the release of the Warmachine and Hordes mark III rules. As such, my youngest and I participated in the league and had an absolute blast. For those not in the know, a Journeyman league involves building your force from a starter box (essentially one warlock/warcaster and from two to four warbeasts/warjacks) to a mighty army of 75 points. It also served to bring us up to speed on the new rules which, while not super different from mark II, had a few key changes. Mostly, it sped up gameplay and made for more aggressive maneuvering and action, so overall, mark III gets a resounding thumbs up. The league gives points for defeating opponents as well as painting miniatures over the course of the league. You get a point per week for each win, as well as a point for having more painted (that means completed) models than the previous week. The scenarios change as well, forcing you to give up your one-trick tactic and do something different. Overall, a lot of fun, and I met a lot of cool players at EG who I would happily cross swords with again. Sadly, the final tournament didn't happen as only three people showed up. However, my youngest daughter took the Destroyer award (for most games won) while I took the Creator award (for best painted). Out of a field of 20 or so, I'll take that! Speaking of painted, I made good progress on my models for my Cygnar force. 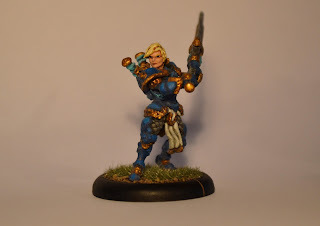 First off is my warcaster, Major Beth Maddox. 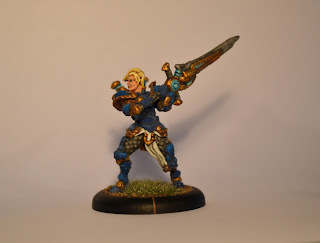 She is new to the mark III release, and while it took me a game or three to start getting the hang of her gameplay, she turned out to be one of my favourite warcasters. 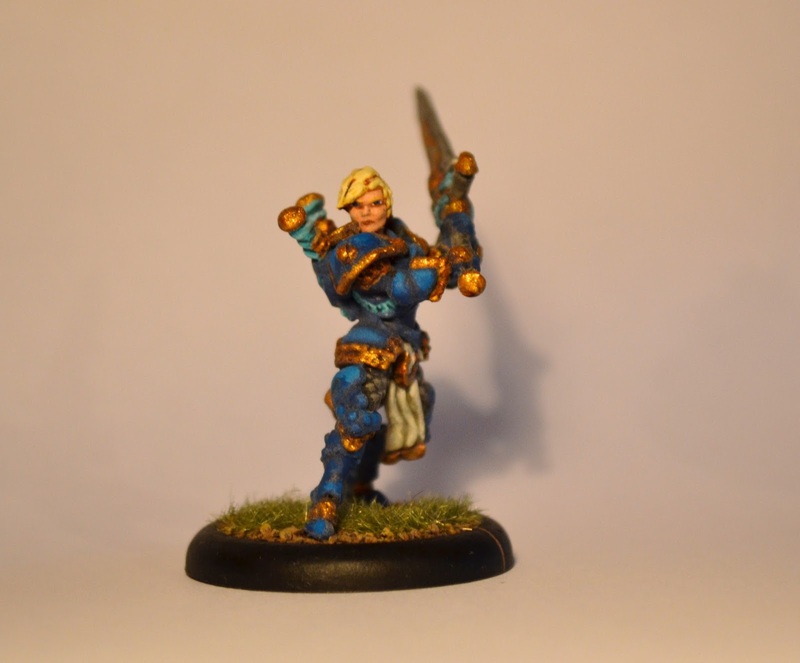 As a Stormblade turned warcaster, she is full of electro-goodness. 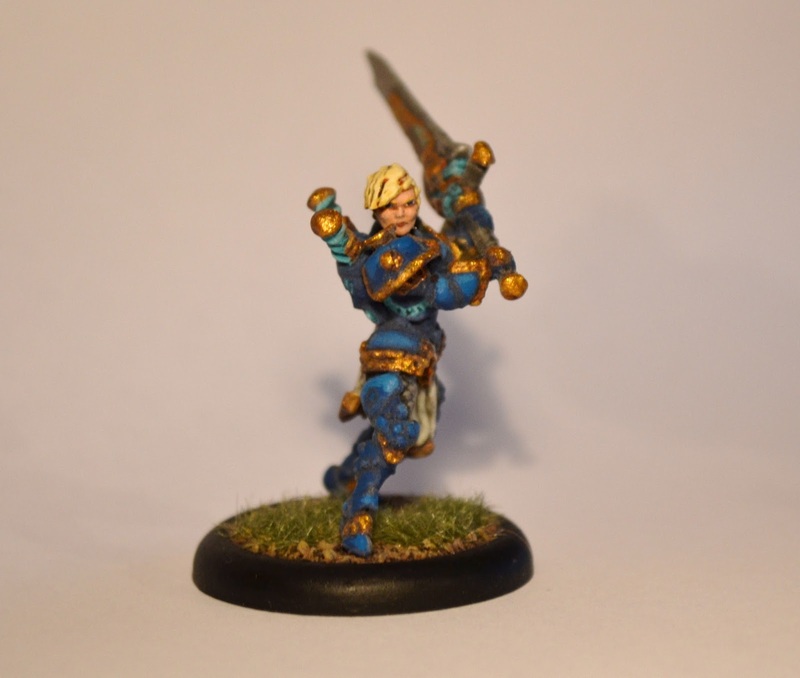 This gives her good synergy with other units, such as Stormblades or warjacks like the Firefly. Frankly, she does a great job supporting an elite troop and several warjacks, by the end of the league I was really enjoying her and her battlegroup. I do need to work on a better photo setup though. Ah well, one thing at a time. 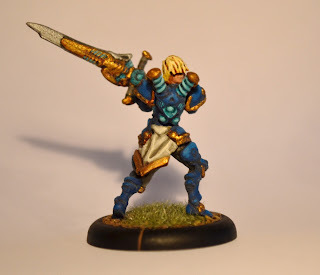 More model photos to follow, and a dissection of the list I finally developed during the league.